Liga.Tennis - Leagues, Clubs, Tournaments, Find a partner. Play tennis competitively or hit for fun without scoring. Anytime. Anywhere. Share your results, photos or videos. Follow anyone. It's free. Playing tennis is a great way to keep fit, have fun and meet new friends. For adults and kids, singles and doubles. 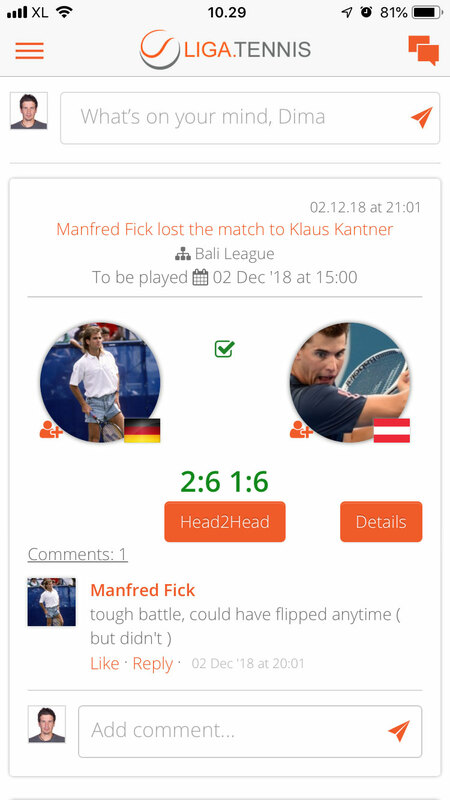 Liga.Tennis is a community which helps players to keep track of their improvement through regular competitive games and puts local players in touch, allowing users to post & share tennis related content and follow each other's activities. 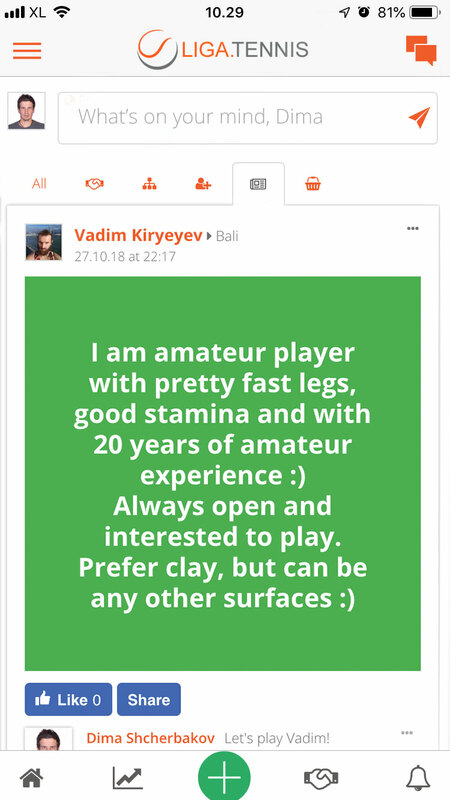 It's very easy to join: all you need to do is to register, choose an appropriate way to play tennis (Leagues, Clubs, Tournaments or Find a partner) and you are ready to go. It's very easy to play: you have the freedom to pick a court and time to play a match. It’s free of charge and there no obligations for you! Its free of charge and there are no obligations for you: play with anyone, anytime & anywhere. Share on Timeline your scores, photos or videos. Follow people you want. Chat in the Messenger. Change your level, city or country in one click in your player profile anytime you want. Play worldwide. Play competitively (League, Club or Tournament) or just hit for fun without scoring (Find a partner). 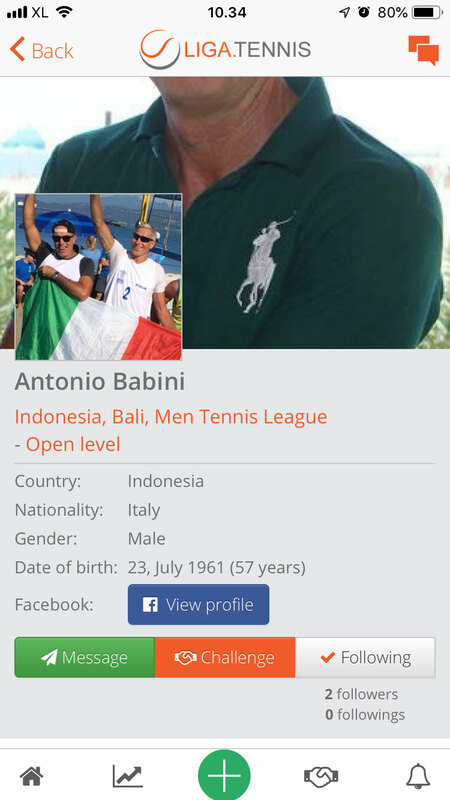 Enjoy Liga.Tennis platform on your mobile and desktop devices. Use Timeline to view the latest activities in your league or club. Post anything you want: scores, photos or videos. 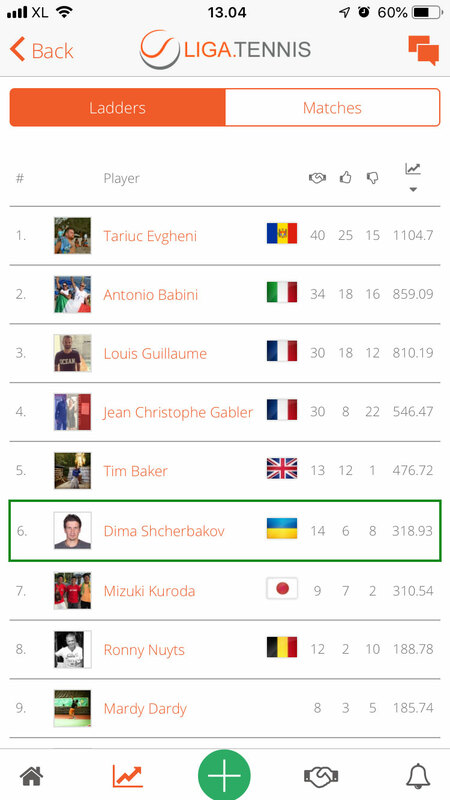 View your tennis ladder & ranking with current points and statistics. Follow anyone and get notified when they play a match, send a challenge, make a post, etc. Сhallenge anyone and manage your challenges anytime you need it. 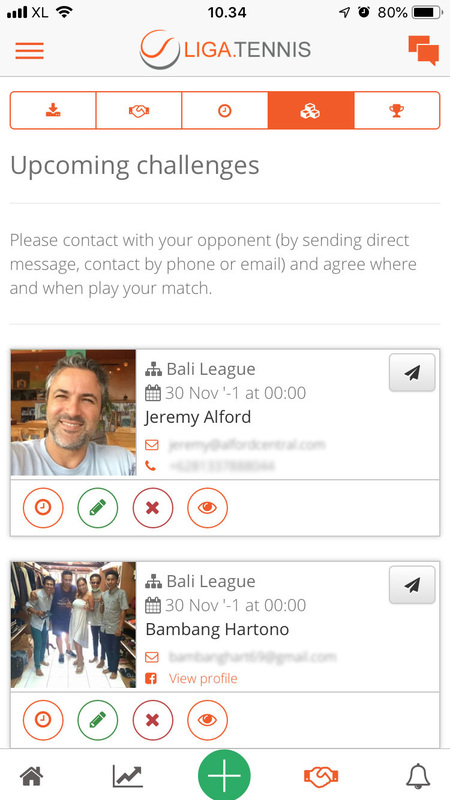 Stay in touch with other players through built-in messenger. 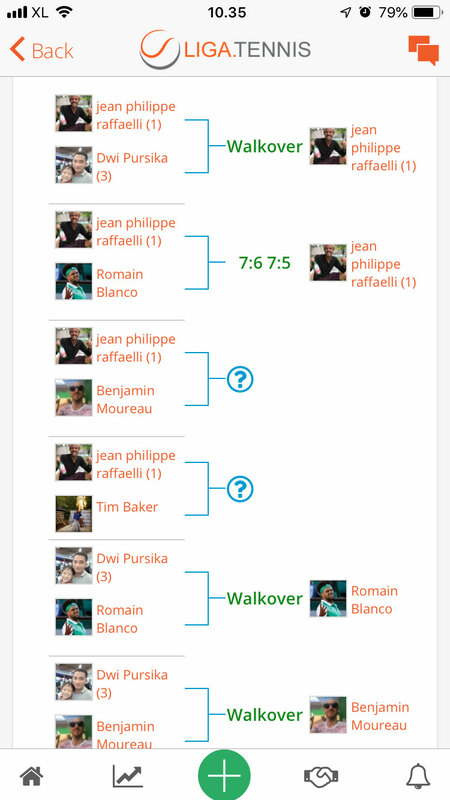 Create your tournament and invite anyone to join: with or without an entry fee. Create and manage your tennis club and even make some money. Change your country and region to play while you’re traveling. Find new hitting partners of any age, level, gender, and play less competitive games (without scoring and sending challenges). Find tennis courts and coaches nearby. 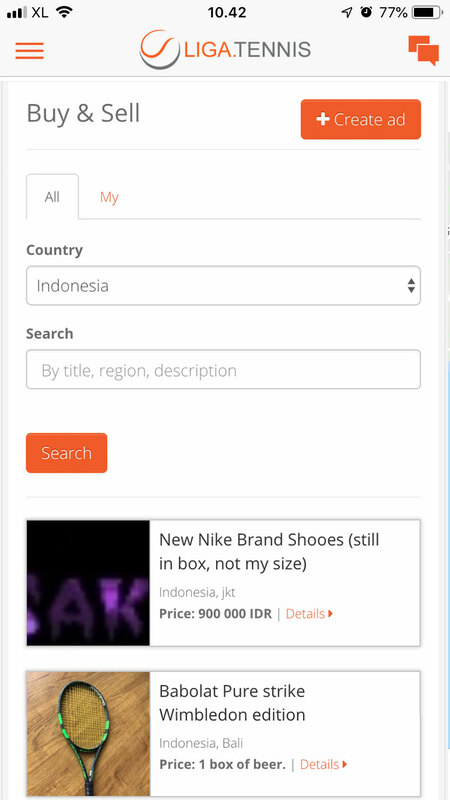 Create an Ad in few clicks and sell anything from your tennis gear. Tennis can be a very frustrating sport. There is no way around the hard work. Embrace it. You have to put in the hours because there is always something you can improve. You have to put in a lot of sacrifice and effort for sometimes little reward, but you have to know that, if you put in the right effort, the reward will come. You have to believe in the long term plan you have, but you need the short term goals to motivate and inspire you. Global ranking displays the total number of points that players earned worldwide: in any Leagues, Clubs or Tournaments. View latest results from different countries. League - is a competition within a particular region and it always opens to the public: anyone can join. Club - is a competition within a particular organization or group of people. Clubs can be public or private. Tournament - is a competition among players of any gender or level, who have been invited by Organiser. How can I join as a player? The process is super easy and very quick. It takes 3 min. To apply as a player, click on ‘Join now’ on this page and follow the simple steps. 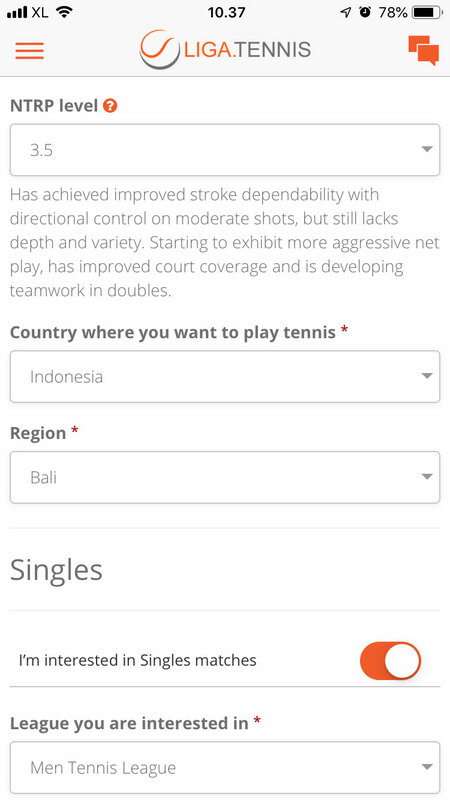 Then you will be able to create your simple tennis player profile directly. Soon enough, you will ready to have a lot of fun playing in Liga.Tennis! What is the difference between Leagues, Clubs, Tournaments and Find a partner? League - is a competition within a particular region (for example, Bali League or West Sydney League) and it is always open to the public: anyone can join. Club - is a competition within a particular organization or group of people (for example, Federer Fans Singapore Club). Just like with Facebook groups, Clubs can be public (everyone can join in one click) or private (Club Organizer must accept new members). Each player can be a member of different clubs. Tournament - is a competition among players of any gender, age or level, who have been invited by the Organiser. Compared to League or Club competitions, you will get more points for winning matches in a Tournament (the more you advance in Tournament draw, the more points you get for each win). 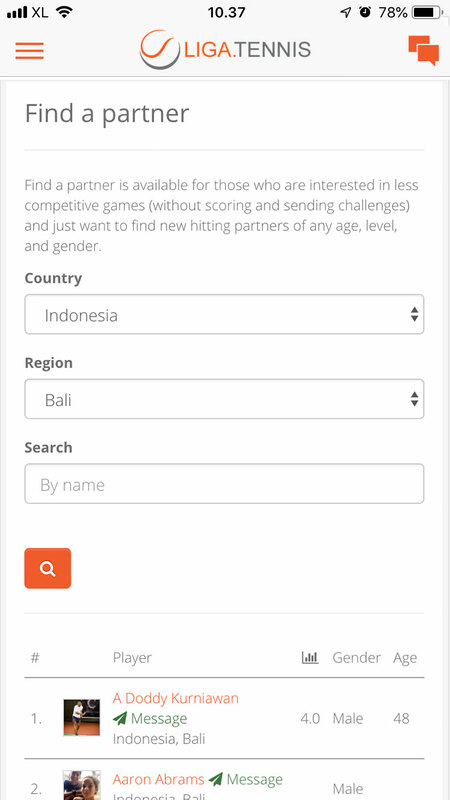 Find a partner - is available for those who are interested in less competitive games (without scoring and sending challenges) and just want to find new hitting partners of any age, level, and gender. I am new here. Where should I join to compete: League, Club or Tournament? Leagues. Join one of our Leagues if they are available in your area. Please check all open Leagues here. Clubs. 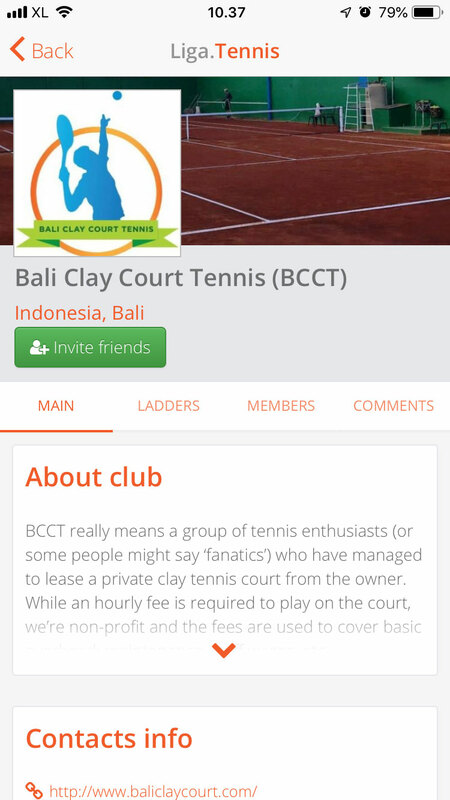 If you don't see any Leagues available in your city, you can join one of the existing Clubs or create new Club in your area, invite just a few or even hundreds of your friends, and enjoy all the features of Liga.Tennis platform (and even make some money). More details on Clubs here. Tournaments. Tournament - is a competition among players of any gender, age or level, who have been invited by an Organiser. This means you can join a Tournament as soon as you receive an invitation from an Organiser. Or you can become an Organiser. Contact us if you are interested to organise Tournament in your area. It's absolutely free of charge for all parties: players, coaches, courts and other tennis related organizations. 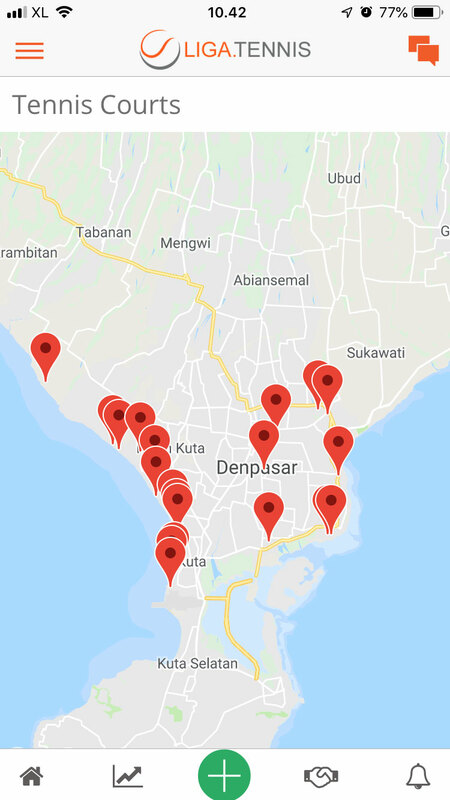 When, where and how can I set up the matches? As a player, you can play with anyone within your Level: anytime and anywhere. There are no obligations even if you play only one match in a month. You and your partner will directly agree on a venue and who provides the balls. It's up to you how to split the cost and book the court, etc. How many matches a month will I play? ✔️win more games in each set. Can I still play in Liga.Tennis while I'm traveling? Yes, you can. In your player profile, you can change country and area in just one click anytime you want. So you can challenge new people and they can also challenge you. All points that you earn while traveling will be accounting in your Global ranking standings. (Already have an account? Press here to Log in).